The Temples at Abu Simbel are located in Southern Egypt, at the second cataract of the Nile, Close to the Sudanese border, built by the Egyptian king Ramses II (reigned 1279- 13BCE), Ramses II chose the site because it was already sacred to Hathor, Goddess of Motherhood, Joy and Love. This act strengthened his divinity in the eyes of the ancient Egyptians. It Encouraged them to believe that he, too, was a God. 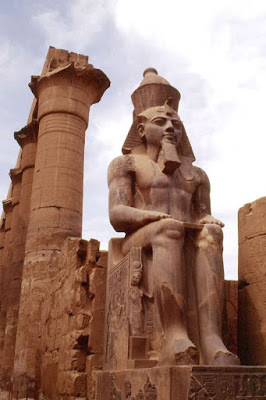 By means of a complex engineering feet in the 1960s, the temples were salvaged from the rising waters of the Nile River caused by erection of the Aswan High Dam. The temples were unknown to the outside world, until their rediscovery in 1813 by the swiss researcher Johann Ludwig Burckhardt. They were first explored in 1817 by the early Egyptologist Giovanni Batista Beloconi. Carved around their feet are small figures representing Ramses' children, his queen, Nefertari, and his mother, Mutty. The Graffiti inscribed on the southern pair by Greek mercenaries serving Egypt in the 6th century BCE have provided important evidence of the early history of the Greek Alphabet. The temples dedicated to the sun Gods Amon-Re and Re-Horakhty, the first rays of the morning sun penetrate the whole length of the temple and illuminate the shrine in it's innermost sanctuary. 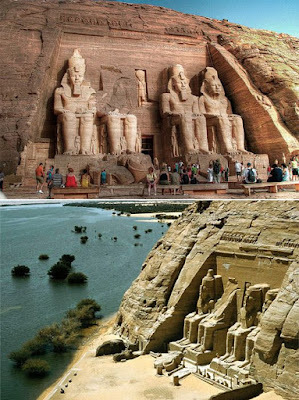 Abu Simbel temples begun with the twenty year effort to build these impressive structures, the construction of Abu Simbel started around 1244BC and was finished around 1224BC. Many Scholars believe that the temples of the Abu Simbel were an act of Ego, pride and love on the side of Ramses II. He ordered these temples built to represent the battle, the base of the temple was carved with figures of bound captives. It was Ramses way of trying to make an impression upon Egypt's neighbours, as well as to force Egypt's religion upon these neighbours. The small Temple is a monument to his most beloved queen (out of his many wives) Nefertari. It is also dedicated to the ancient Egyptian Goddess Hathor. 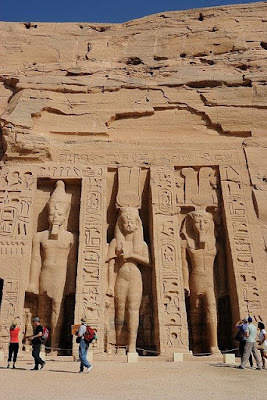 Temple of Hathor and Nefertari, Abu Simbel, Egypt. The Great Temple Ramses had built to honor himself, dedicating it to the God Re-Horakhty.